Menu name must be 1 - 20 alphanumeric English-only characters without spaces or punctuation. The first character must be alphabetic only. Examples: MainMenu, Project1MainMenu, SideMenu2. The menu can have a horizontal or vertical orientation. Menu width can be in pixels, percent, or defined automatically. The Menu alignment can be set if the width of the menu is defined in pixels or percentage. To turn off the menu's background, check the Transparent menu option. Submenus height - specifies the maximum height in pixels for submenus. A submenu automatically becomes scrollable if its height less than the real height of its contents. Submenus opacity - sets the transparency level in percent for submenus. 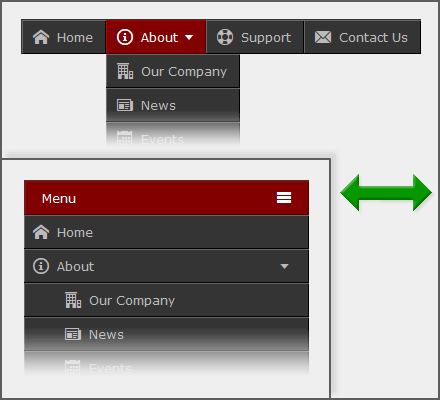 Hover - submenus are opened automatically when a user moves the mouse pointer over the menu element. Click/Tap - submenus are opened by a mouse click or finger tap. Goes away - submenus are closed automatically when the mouse goes away. Click/Tap outside - submenus are closed by a mouse click or finger tap outside the menu. If the viewport width is less than the width of the menu bar, an alternate compact menu appears. Enable the Responsive menu feature. Open the menu in Preview Window. Resize the window; set the width less than the width of the menu. If the menu includes a large number of items, enable the Expandable nodes option to save screen space.